“I am an American citizen, Irish-born. I’ve been living here for nearly 25 years and have a family of my own here. In October of 2001 I petitioned for my brother to come to the U.S. I occasionally check the dates to see when he may be called for an interview, and I see that those who filed petitions early in 2001 are now being called. So it’s getting close. “We filed the petition at a time when my brother was single and didn’t really have any roots. Since then he married and had a child, and has a fairly stable job in Ireland. He loves it out here and I know he would do well, but he’s not sure he wants to proceed with the application. I think it would be a wasted opportunity if he doesn’t follow through, given how long it’s taken to get to this point. Ireland being Ireland, he could lose his job at any time. I agree, you and your brother have been waiting a long time for a family fourth preference visa, available to siblings of U.S. citizens and their spouse and minor (under 21) children. There are only 65,000 of them each year and a huge waiting list – those who filed petitions on or before April 15, 2001 are in line for final processing in February. It’s understandable that you would want to safeguard the visa. Though his priority date of October 2001 is approaching, you can expect a further wait of at least several months. It isn’t possible to put the visa “on hold,” as you say, but the process can be slowed somewhat. It’s possible that the National Visa Center (NVC) will request updated paperwork for his case given how long ago it was filed. That’s a process that will require some time to deal with, especially if the NVC requests a new police report. There’s one pertinent fact to bear in mind, though, according to immigration attorney Bruce Morrison. Do not go more than one year without responding to the NVC, and any correspondence should take place well within a 12 month period. When your brother is given an appointment for an interview in Dublin he can request a delay, but again, this delay shouldn’t come close to a year. Delaying confirmed immigration appointments can sometimes bring unintended problems too, so really, once your brother receives his date, he should prepare to proceed as quickly as possible if he intends to take up the visa. If your brother and his family succeed in obtaining permanent residence, they can travel to the U.S. and file for an I-131 re-entry permit with the U.S. Citizenship and Immigration Service (USCIS). These documents allow permanent residents to reside outside the U.S. for up to two years without affecting legal status here. Each family member would have to apply for a permit (current filing fee $360, plus $85 biometrics charge for those aged 14-19). The permit must be applied for prior to leaving the U.S. Applicants should expect to wait here for several weeks for biometric (fingerprint) appointments; once they have been completed the applicant can depart. The approved permit can be sent to a U.S. consular post in the country where the applicant will reside. The I-131 paperwork requires a U.S. address – presumably your brother can provide yours. Applicants should also bear in mind that compliance with federal U.S. tax laws will also be required during the time away, given that they are considered to be permanent residents of the U.S. 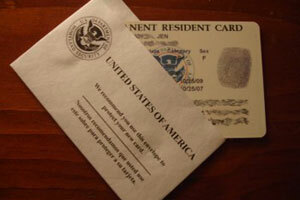 The USCIS website at www.uscis.gov has plenty of information about applying for a re-entry permit.